Let me share with you an important piece of hard truth: most of you will not produce a great design project this semester. While I hope that you will all begin with aspirations of greatness, I know that many of you will stumble somewhere along the way. In the past four years of teaching a masters level design studio at the University of Melbourne, I have witnessed this with my own eyes: students who never quite get it from day one; and students whose work shows early promise only to unravel down the track. A great project is a marathon not a sprint. It relies on getting a very long list of things very right. I say this with the understanding that I did not always get this list right. Looking back on my student years, I am surprised I managed to get good marks at all. I swam blind through the design process, only fractionally more self-aware than a tree, and committed most of the sins I now know to be essential ingredients in the recipe for failure. Some of the ideas address big picture issues, others the minutiae. My focus will be on architecture, but most of what you will read is equally relevant for all creative disciplines. Starting tomorrow, I will publish one lesson each weekday. 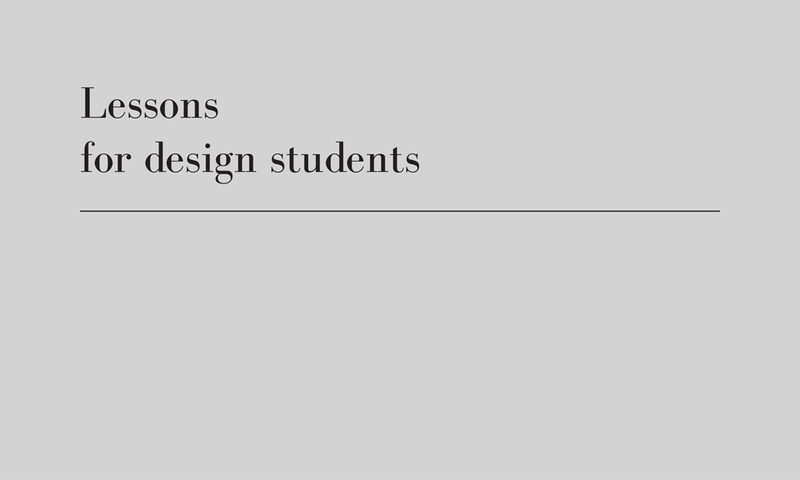 The series will also be archived under the tag, lessons for design students. Lessons for design students, author’s own image. As a student starting my second semester of Masters, can’t wait to see these posts. Good to hear, hopefully you get something out of them!